Our thanks to Kohl's for providing a gift card to help facilitate our Mother's Day feature and a gift card for a One Savvy Mom reader. All thoughts and opinions expressed are our own. Mother's Day is just around the corner and Kohl's has some fabulous finds for mom this holiday, that won't break the bank. We recently shopped our local Kohl's and let me just tell you, there are deals to be had at Kohl's this Mother's Day! Check out the above video to see what I picked up to celebrate the Moms in my life, this Mother's Day. Kohl's has great Sonoma Life + Style boxed candles for just $7.99 AND they're ready to gift in a pretty box, complete with a bow and tag. They also have some super cute frames! We picked up a Sonoma Life + Style frame with the saying "You are My Sunshine" for only $7.49 [just pop in a great picture and add a bow]. We also thought it would be fun to gift a box of Mom's favorite K-cups [currently $13.99] with a cute travel mug or insulated cup [sometimes it's the simple things that help to bring joy to mom's day]. If your in the market for some chic fashions for mom this Mother's day, Kohl's has an amazing selection of exclusive collections, at great price points! We picked up a Sonoma Life + Style Chevron Maxi Skirt [cotton blend] and a Daisy Feuntes "Favorite Tee" [currently $9.99] - chic and comfortable! What more can a mom ask for? Celebrate the moms in your life this Mother's Day holiday, with something fabulous from Kohl's! 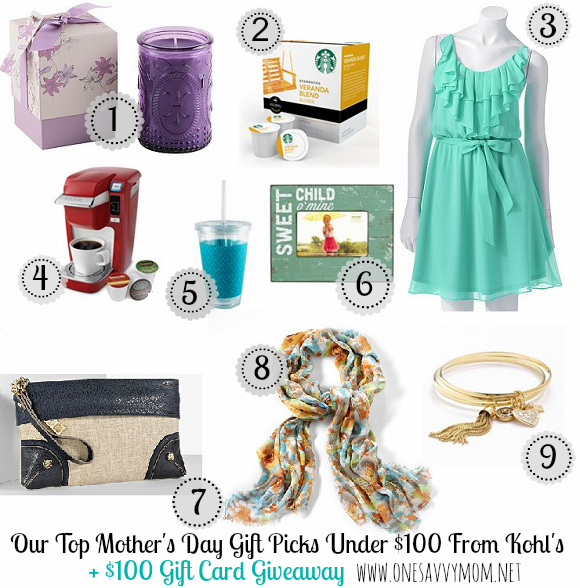 (1) One Savvy Mom reader will receive a $100 Gift Card! Enter through the Giveaway Tools form below. I'd like to receive the Conair Infiniti Pro Hair Dryer because my current one isn't very powerful. I would love the green Keurig mini! I would love to get the Keurig B70 Platinum Coffee Brewer for Mother's Day! I like the Croft and Barrow Smocked Challis Dress. I would like the Food Network 3-pc. Cookie Sheet Set...I just told my son that last week. I would like the Keurig B31 MINI Plus Personal Coffee Brewer. Maci convertible crossbody bag in blue! I would love the KitchenAid Artisan 5-qt. Stand Mixer! Nicole Lee Misha Studded Chevron Tote in black. I would love a Keurig or KitchenAid Mixer! I like Mariah Carey Dreams Fragrance Collection 1.7 oz. I want the A2 by Aerosoles Plushfever Wedge Sandals. Thanks for the chance to win! I'd like the KitchenAid artisan stand mixer. I want the KitchenAid Professional 600 Stand Mixer. Juliann Display Shelf would be my choice. I would LOVE to receive the Starbucks Veranda Blend K-cups! I would love the KitchenAid Artisan 5-qt. Stand Mixer. I have always wanted to own one. The Keurig would be amazing! Would love to receive the Chaps Buckle Satchel! I'd love the Simply Vera Vera Wang Swirl Chiffon Tank! The KitchenAid Artisan 5-qt. Stand Mixer would be nice. I'd love to receive the KitchenAid Classic Plus 4.5-qt. Stand Mixer!